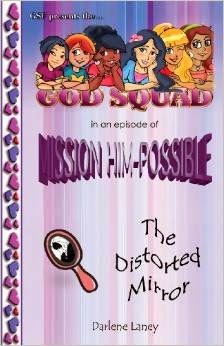 God Squad: Mission Him-Possible-The Distorted Mirror by Darlene Laney tells the story of six ordinary girls who do the extraordinary! Mia, Sadie, Jade, Angel, Chris and Eve are just your average teenagers attending Carver Preparatory. Then they get the call" to walk in the faith and hope offered in Jesus Christ. These six make-up the God Squad. Their mission: save the lost and help those who call out for help. With help from the Holy Spirit and covered with the full armor of God, they set out in prayer power to accomplish the impossible. Their target: an unlikely girl willing to do anything to be part of the "popular" group. Filled with exciting real-life drama, Darlene Laney teaches young girls that they are anything but "unpopular" and popular in God's book, revealing their true worth and destiny in this exciting episode of the God Squad: Mission Him-Possible-The Distorted Mirror.